You can support our work through donated items or services. We’re deeply grateful to those who provide pro-bono services, equipment, and supplies! These donated items and services help us stretch our pennies a little bit further. Athletic equipment for soccer, baseball, lacrosse, and basketball. $10, $25, or $50 Gift Cards for Wal-Mart, Starbucks, Gas, Chik-fil-A, or Olive Garden. We use these Gift Cards as awards for our part-time college students. School Uniforms – khaki pants or shorts and red, white, or navy collared shirts. Please note, at this time we are not able to accept used items. Catering for meetings and special events. Box lunches for meetings or “fun” food for special events with our kids like pizza, chicken fingers, and cupcakes. Event/meeting space in Charleston, SC that accommodates 100 for full-day training session in July/August. 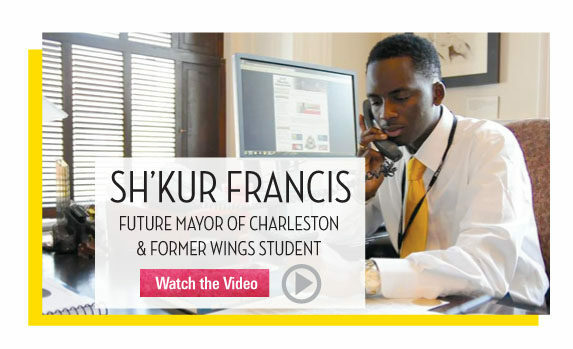 Sh’Kur calls WINGS a “life-changing” experience.